No one likes to be pressured, but all of us are impacted by forces that we can’t control. Every day, consumers are exposed to hundreds of ads and promotions, ranging from radio ads to the signs on the side of the bus stop. Our family, friends, social groups, and perhaps even the state in which we live all contribute to our brand preferences. Think about it – do you prefer Nike or Adidas? Taco Bell or Chipotle? Ford or Toyota? What about the rest of the state? How does where we live impact our preferences? 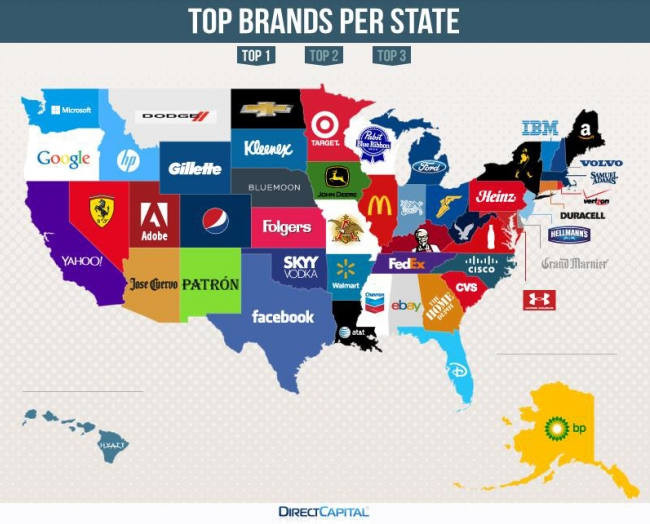 Curious about the answer, Direct Capital, a small business finance company, analyzed Google trends for more than 200 top brands in the U.S. Based on the results, the company created maps that show the branded landscape of the 50 states. Before looking at the charts, take a guess. What do you think is the most popular brand in your state? Discuss the impact of outside influences on consumer purchases and brand preferences. Divide students into pairs. Have each pair of students list the top three brands that might be Googled in various states. List the guesses on the board. Discuss why these preferences exist. What can companies do to create a strong preference for their brand within a specific state?